No, Miss Barnes is not temperamental, glamorous or mysterious as yet. And she actually doesn’t bite. And Carman would love to have the two little Jackson girls come to visit her in the sad little town of Hollywood, if she doesn’t take that little actress away on location. You see, Miss Barnes’ first picture may be made in Florida, but even if it isn’t, Carman would be a dull hostess having to put the blonde star to bed every night at eight o’clock, tucking her in between the ermine lined sheets and smelling her breath to be sure she hasn’t sneaked a high ball. Miss Barnes will tell you that it’s no cinch being a movie star. However we’ll see how things work out, and how much breathing space she’ll get between pictures. Old writer Carman is sailing for Europe in July–believe it or not–which you probably don’t by now. The screen’s newest siren—who kisses—and wonders if her chin’s at the right angle (before the camera)–doesn’t attend many Hollywood parties, so it might be dull for the little Jacksons. Hollywood parties are—Hollywood parties. Very ginny, and very disillusioning. The last one Miss Barnes went to, an important studio executive engaged in a little battle on the floor with an important Broadway playwright–with much rolling gnashing of teeth, blackening of eyes, and —it is said shamefully—biting! All the sweet young thing’s were there too, Mary Brian, Janet Gaynor, Frances Dee, Philips Holmes, Betty Davis— and you know, they are very, very nice. So is Carman Barnes. She went home very ill, and it took the young thing two days to recover. But honestly, I can’t stand that sort of thing, and it happens so often and so easily here. It would be bad if it ever reached the newspapers, too. Hollywood is nutty over gossip–at any cost. When the young actress isn’t working, I loll on the beach, ride horseback three or four times a week. A young English boy and I ride early Sunday mornings, way up in the hills. We gallop up, swing around overhanging cliffs, almost leap off into the air, swerve, brandish our sticks, and shriek: “We have met the enemy in the passes and he is ours!” Try it some time. It’s great sport. I have a nice tan, too, and am very healthy. After you’ve once “been places” in Hollywood, there’s no reason to go again. Everything is of a sameness, the people are the same, movie people, they talk about the same things, movies, they eat the same thing, movies, and they drink the same thing, movies. Everyone likes to go to the Brown Derby once–but after a few times, it’s nothing but a small town café with hard seats and bad food. Primieres are fun—once, and sort of amazing, too, with thousands of people lining the side walks, great fires burning in the streets, carpets, canopies, flowers, radio announcers, ermine coats, stars swamped with orchids, glaring arc lights, and the “herd” yelling for autographs. But after one–they’re all alike, maybe the lights are bigger, the fires brighter–for one star than for another, but that’s all. Now, have I disillusioned you in your glorified conception of Hollywood. You might like it, I don’t know. There are so few people here worth knowing, so few who have any back ground, any culture, any intelligence, any humor. I go out with very few people. Tom Douglas, for one, the boy who is to play with me in my picture. He is charming, very humorous. He is southern and from a good family. That can’t be said of many people out here. And more than anything, he is not a ham, nor a “pretty” movie actor. I go out with a young producer and a young scenario writer, and Jack Spurlock, a boy from home who came out with us. That’s practically all. You’d be surprised how quiet the lives are that most people lead in Hollywood. Did you know that the streets were deserted by twelve o’clock? As I said before, the kid could write. Hollywood’s newest Cinderella is Carman Dee Barnes, eighteen-year old writer who ground out a story called “Schoolgirl” when she was fifteen. Last fall she went west for Paramount to write. Now she’s to play the leading role in a story written by herself. She’s reported to have said that she’s a little shy of pictures because she has to write down to her audiences! This, from a kid writer of frenzied flapper fiction. Are we allowed a small chuckle, or a modest guffaw? Sure! What chance will a girl in her teens now have to impress a movie producer, unless 1. She has tossed off a couple of novels? 2. She has gifts as a sculptor, playwright and musician? 3. Possesses a flair for snappy and sophisticated conversation? 4. Is — in a word — just a whirlwind of intellectuality? Carman Barnes, eighteen-year-old Paramount discovery, sets a standard that must be wretchedly depressing to any young seeker of celluloid honors. For she has a veritable galaxy of smart attributes, including those above enumerated. And what a free, informal soul this young maid of movieland is, incidentally! Our first glimpse of Carman was on a breezy day in the broad open spaces of the studio, clad in a futuristic-looking bath robe, and gayly diverting an audience of three wise old scenario writers with her piquant repartee. Carman was waiting photographic test time, and if the breezes blew lightly on her loose-fitting outer garment, she should worry. Persiflage and the laughter took complete precendence over the day’s chilliness or the wind’s revealing whimsies with a lady’s boudoir habiliments. 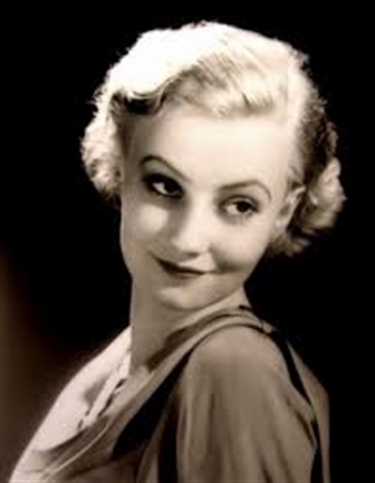 An insouciante, charming, and distinctly clever young woman from the Southland is this precocious author of “School Girl” and “Beau Lover,” who is to appear in her own story, “Débutante.” Amazing as it may seem, she sometimes photographs not unlike Garbo. 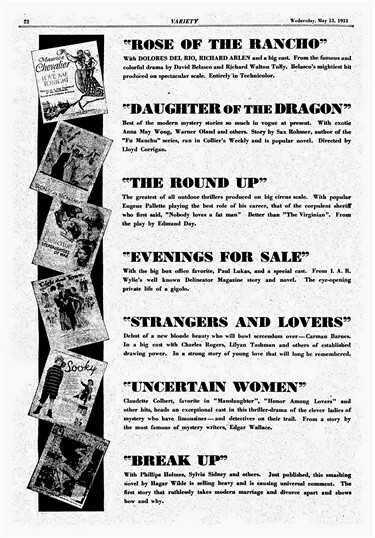 The change from (Confessions of a) Debutante (Confesses) to Strangers and Lovers became official in an ad Paramount placed in the May 13 issue of Variety: “Debut of a new blonde beauty who will bowl screendom over — Carman Barnes. In a big cast with Charles Rogers, Lilyan Tashman and others of established drawing power. In a strong story of young love that will long be remembered.” So this was the fulfillment of Variety’s February 11 item — two veterans, Charles “Buddy” Rogers and Lilyan Tashman (not to mention “others of established drawing power”), were coming aboard to do some of the heavy lifting for Carman and her “co-star” Tom Douglas. And in case you’ve lost track, in less than a month the story has gone from “a tale of a girl who is afraid she is wicked” to an “absorbing drama of an innocent-wise 19-year [old] charmer in a barracks town” to “a strong story of young love that will be long remembered.” An observant reader might have thought that somebody at Paramount was having trouble remembering that story for very long — might indeed have wondered if there was a story at all. Is She an Actress? The announcement that Carman Barnes, the child prodigy author, was also to act for Paramount fell like a bombshell in the New York hotel where she used to live. It happens that I live there now, and all the bell boys think I ought to know her just because I, too, have a typewriter. Reading that item, Carman the mature-beyond-her-years phenomenon suddenly sounds 18 again. Or rather, 17 — the age at which those New York bellhops knew her (and no doubt eagerly devoured “that dirty book she wrote”). In that same June issue of Picture Play, Edwin and Elza Schallert in “Hollywood Highlights” commiserated with Carman for having “to sign her movie contract in the presence of a judge, because she happens to be a minor!…Movie companies arrange to have contracts with minors signed this way so that they may not be broken on the grounds of youthful incompetency of the player in business matters.” But this was old news by June: that hearing had happened way back in March. Still, it was publicity, and it lent the juggernaut of Carman’s approaching stardom the imprimatur of the California State Superior Court. Anyhow, the days of magazine profiles, ballyhooing ads and gossip-column plugs, of Carman’s partying and horseback riding and enduring the hard seats and bad food of the Brown Derby, were reaching a climax — Carman was finally going before the cameras.